More capacity and productivity. The latest harvesting technology available in the market. 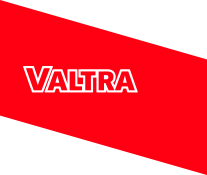 Valtra offers you the best harvester solutions in the market. 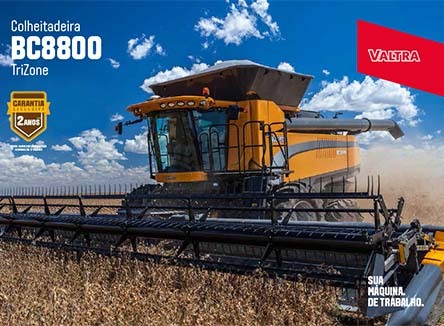 Innovation and more productivity per hectare are features of the axial harvesters Valtra BC 7800 (410 hp), the best Class 7 yet manufactured in Brazil; the BC 8800 harvester (470 hp), which has the highest technology in Class 8 machines; and now the BC 6800 (350 hp), the newest member of the family. In addition to the largest discharge rate in the market - the CL6 has 88L/s - it also has a system that eliminates the use of the rotating screen, the V-FLOW, developed to get rid of straw and waste. The system prevents obstructions, uses less power and reduces daily maintenance. 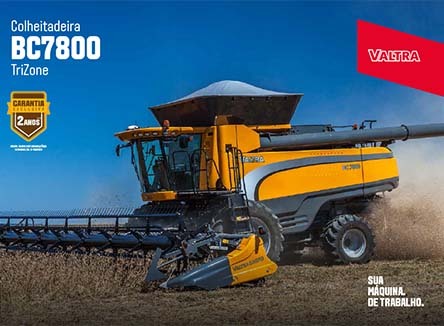 With an amazing design and an innovative project, the new Valtra 800 Series axial combine harvesters are equipped with the latest harvesting technology available. It offers the best ratio of liters/tonnes harvested among all representatives of their respective categories. 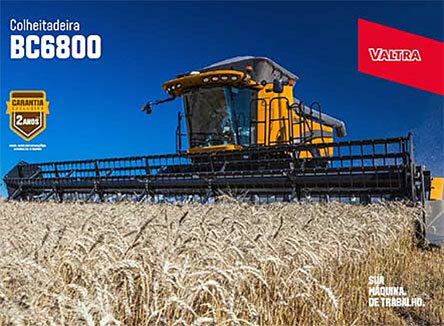 The new 800 Series combine harvesters from Valtra using a multiphase grain cleaning process. This system has a 460 mm diameter fan that ensures much more air in the upper duct and full pressurization of the sieves. To achieve this increased cleaning capability, there is a 6.1 m² total cleaning area. On the CL6, it is 5.1m², and we also increased the size of the clean grain spiral - delivering up to 60% more grain flow to the elevator, also satisfying the higher capacity of the new processing system. The unique H-shaped design of the concave part support system allows any of the 12 concave parts to be easily replaced by one person. The different types can be combined side by side or front to back to offer the best performance in different types of cultivation. This new system also has a suspension system using springs, which offers the machine more protection against momentary overloads or the ingress of foreign bodies, assisting in the disposal of this material. In addition to a striking design, the 800 Series also has a cab that provides greater comfort and visibility. There are also features like an air suspension seat, rear-view mirrors with electric drives, opening and closing of the grain tank cover (optional) and many more. The highlight is the BC 8800, the only machine in the Class 8 harvester market with 620/70R42 tires. 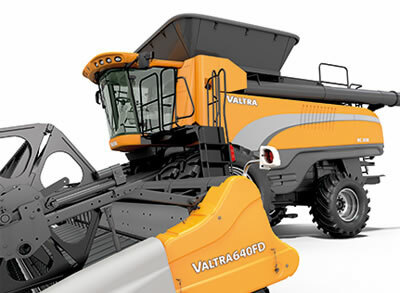 The new harvesters in Valtra 800 Series are ready to use all available technologies: Fieldstar II productivity monitor, Auto-Guide 3000 automatic pilot and AgCommand® telemetry.